It's a good thing I got laundry, (and a few rounds done on the secret sock) yesterday morning. That's the first 41 rounds of the shawl. (41 of 45 R's to the first chart) I love it, I love it, I love it. I could have stayed up half the night, and finished the last few rounds of chart 1, but some semblance of reason kicked in, and I finally put the knitting down (at about 1 AM). Gently stretched, this morning, it's about 8 inches across. And beginning to take shape. 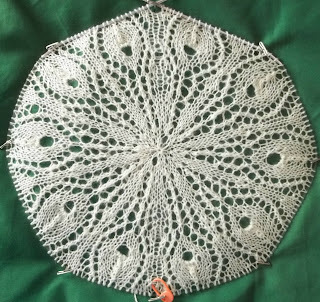 Relatively speaking, it's an easy lace. Each motif is symmetrical, and there are 10 repeats per round—so, its easy to memorize—by repeat 3. When I finish the first the first chart, I'll likely add a life line, but I don't think I'll really need one. Chart 2 is almost the same as chart 1. It's 2 R's longer (but then, the eye has 9 stitches (vs 5) and the extra rounds are 2 pair of double decreases. I've made 1 or 2 mistakes—and had to tink a dozen or so stitches—but for the most part, the pattern makes sense to me, and it's easy to just knit. And knit I did. It was so easy, the mistakes were early in the process, (and still learning) not late (at night) when I was getting tired. Hand painted, after it was knit—and I think all my previous experiments with dyeing were nature's way of making me ready to do this! That version also has beads, and I had considered adding beads, too, but I am working with almost cobweb weight yarn, and thought beads might make it too heavy. Besides, I want the knitting to be the star. I am going to finish Chart 1 today, and then put it aside just long enough to finish the secret socks. 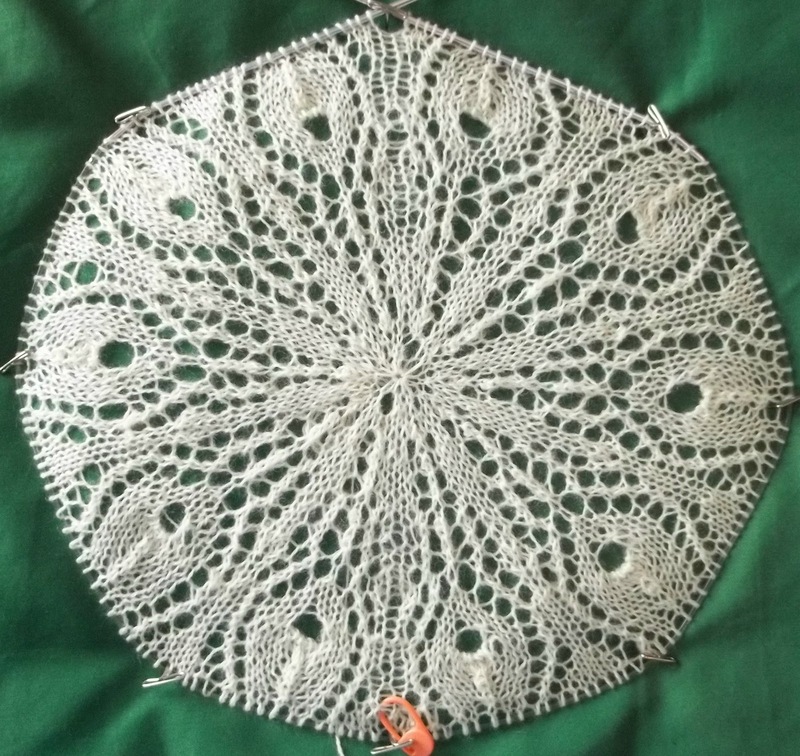 I think I am going to have ration work on this shawl—It could easily take over my life!